You can enable inventory tracking for an Azure virtual machine from the virtual machine's resource page. You can collect and view inventory for software, files, Linux daemons, Windows Services, and Windows Registry keys on your computers. This method provides a browser-based user interface for setting up and configuring inventory collection. This article assumes you have a VM to configure the solution on. If you don't have an Azure virtual machine, create a virtual machine. 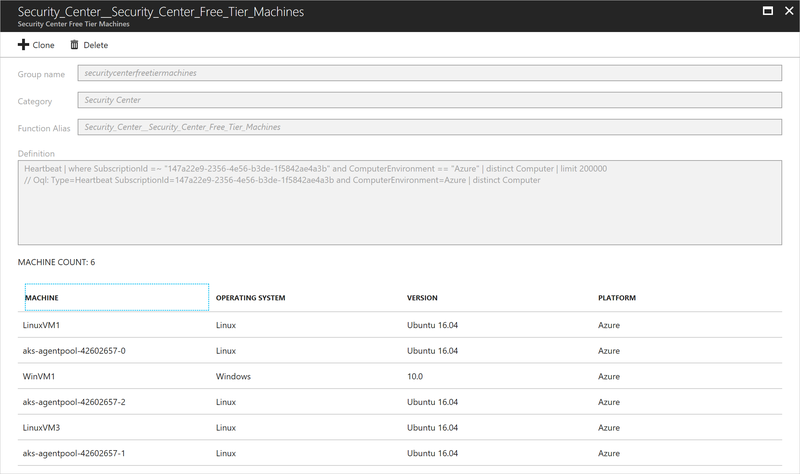 In the left pane of the Azure portal, select Virtual machines. In the list of virtual machines, select a virtual machine. On the Resource menu, under Operations, select Inventory. Select a Log Analytics workspace for storing your data logs. If no workspace is available to you for that region, you are prompted to create a default workspace and automation account. To start onboarding your computer, select Enable. A status bar notifies you that the solution is being enabled. This process can take up to 15 minutes. During this time, you can close the window, or you can keep it open and it notifies you when the solution is enabled. You can monitor the deployment status from the notifications pane. When the deployment is complete, the status bar disappears. The system is still collecting inventory data, and the data might not be visible yet. A full collection of data can take 24 hours. By default, software, Windows services, and Linux daemons are configured for collection. To collect Windows registry and file inventory, configure the inventory collection settings. In the Inventory view, select the Edit Settings button at the top of the window. To add a new collection setting, go to the setting category that you want to add by selecting the Windows Registry, Windows Files, and Linux Files tabs. Select the appropriate category and click Add at the top of the window. The following tables provide information about each property that can be configured for the various categories. Windows Registry Key The path to check for the file For example: "HKEY_LOCAL_MACHINE\SOFTWARE\Microsoft\Windows\CurrentVersion\Explorer\User Shell Folders\Common Startup"
Enter Path The path to check for the file For example: "c:\temp\myfile.txt"
Enter Path The path to check for the file For example: "/etc/*.conf"
Recursion Determines if recursion is used when looking for the item to be tracked. Use Sudo This setting determines if sudo is used when checking for the item. Links This setting determines how symbolic links dealt with when traversing directories. Inventory allows you to create and view machine groups in Azure Monitor logs. Machine groups are collections of machines defined by a query in Azure Monitor logs. To view your machine groups select the Machine groups tab on the Inventory page. Selecting a machine group from the list opens the Machine groups page. This page shows details about the machine group. These details include the log analytics query that is used to define the group. At the bottom of the page, is a paged list of the machines that are part of that group. If you want to create a new machine group, select + Create a machine group. This button opens the Create a machine group page where you can define your new group. Click Create to create the group. In the left pane of the Azure portal, select Log Analytics, and then select the workspace that you used when you onboarded your virtual machine. In the Log Analytics window, on the Resource menu, under the Workspace Data Sources category, select Virtual machines. In the list, select the virtual machine that you want to disconnect. The virtual machine has a green check mark next to This workspace in the OMS Connection column. OMS is now referred to as Azure Monitor logs. At the top of the next page, select Disconnect. In the confirmation window, select Yes. This action disconnects the machine from management. 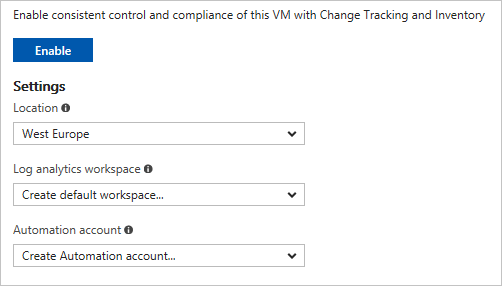 To learn about managing changes in files and registry settings on your virtual machines, see Track software changes in your environment with the Change Tracking solution. 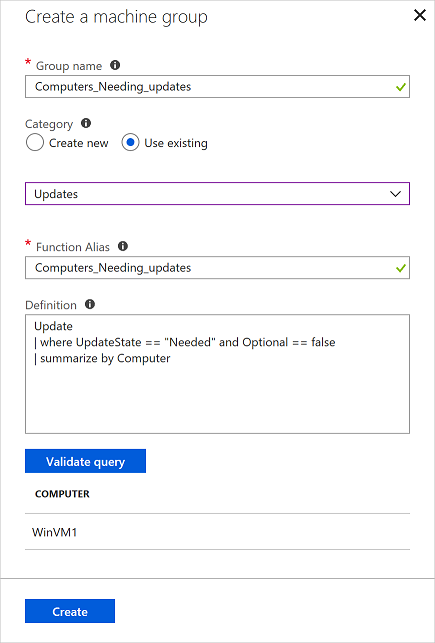 To learn about managing Windows and package updates on your virtual machines, see The Update Management solution in Azure.